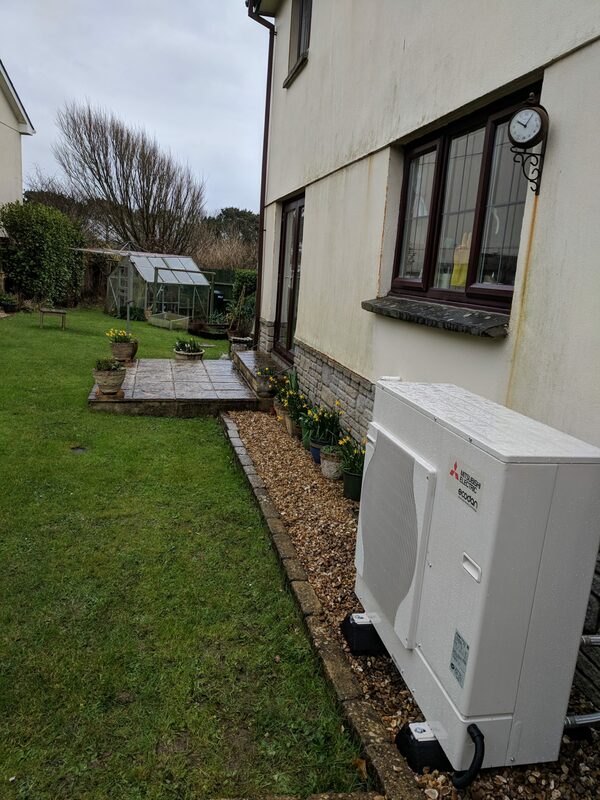 A 2018 air source heat pump installation in Mullion, undertaken by GreenGenUK. This Mitsubishi Ecodan unit provides the entirety of the home’s space heating and hot water demand. By coming away from their previous oil system and replacing it with air source, the property’s heating demand is now carbon friendly and cost-effective. GreenGen were also responsible for amending the existing central heating system to meet the demands of air source heating and the removal of the existing oil system. Firstly, air source’s efficiency reduced the home’s annual heating bills by £400-a-year. Secondly, the government’s Renewable Heat Incentive provides a financial subsidy to those making the switch to renewable heating. The property’s demand combined with the efficiency of this heat pump means the Mullion-based customer earns £1300-a-year through the RHI. Find further information on the RHI on our Renewable Incentives page. Thirdly, switching from harmful oil slashed the customer’s carbon output.. GreenGen calculates this green heat pump installation will reduce the home’s carbon footprint by 4.5 tonnes. Is Air Source right for you? As all installers should, the start to all of GreenGen’s air source installations begins with a site survey. Although we are confident air source can be tailored to all properties, this initial consultation provides us with all the information we need to accurately and confidently recommend air source to our customer. To consider air source and to check it’s viability in your home, contact us today to speak to one of our experts and to book your free survey.